The third of the Palestrina Masses to be recorded in this series, this is the first recording of a Mass published in 1600. A similarly titled Mass for four voices, based on the same chant antiphon and published in 1601 (not 1554, as the notes have it), was once recorded by Johannes Somary. Here it climaxes a group of works for Eastertide that includes the double-choir Stabat Mater, one of the composer’s finest motets (here furnished with a more extensive note than most recordings of the work have enjoyed), a work that was sung exclusively by the Sistine Choir during Holy Week; the hymn Ad caenam agni for Sundays after Easter, set here in alternatim style; one of his two eight-voice Marian antiphons for Easter, Regina caeli, not related musically to the Mass sung here; and three offertories for Sundays in Eastertide from the wonderful collection of offertories for the entire year published in 1593. Also included are three motets from Canticum Canticorum, continuing the series of motets that Christophers includes on each disc of this new series. This Regina caeli does not turn up in a cursory search of my collection, but the Stabat Mater is found on numerous discs. The Mass is of such exquisite perfection (a phrase that could be used for so many of the composer’s Masses) that its neglect on records is hard to understand. Even at this late date, we still have only 70 or so of the 105 published Masses. The choir is SATTB, and the familiar antiphon melody occurs frequently, notably as the opening notes heard at the beginning of the Kyrie, Credo, and Sanctus. The second Agnus Dei is supplied in chant from Mass VIII, and the third invocation is set for SAATTB. The note by Martyn Imrie begins with a discussion of the basilicas of Rome, including a passing reference to the restoration of the Sistine Chapel; as we saw in the Sistine Chapel program under Collections, it was not restored but rather built in 1475-82 to replace an earlier chapel. He wryly points out that the Sistine Chapel today sees a daily stream of tourists who pay admission in place of its true purpose as the site of daily liturgical ceremonies, which were attended by a congregation, not just the choir and clergy. 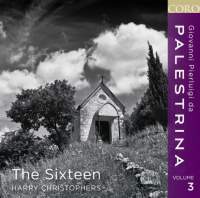 I eagerly await the next disc in this series, which should become a valuable survey of Palestrina’s sacred music.